Last weekend the Congress of Zero Waste Europe was held in Gipuzkoa. 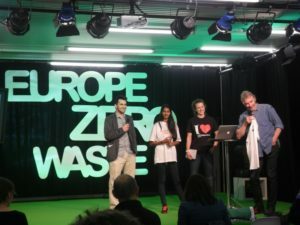 Representatives from all over Europe together with guests from the US and India came together to exchange best practices and define next steps for the Zero Waste movement in Europe. The event was a success of participation and also media coverage; 30 international representatives from all over Europe, more than 30 mayors, including the mayor of San Sebastian, the top regional authorities including the first councilor of Gipuzkoa and the councilor for the Environment, as well as many local zero waste activists and citizens. All in all, during the 3 days of the event more than 300 people assisted the ZWE congress! During the event the participants visited succesful experiences such as Usurbil and Hernani, leading separate collection municipalities in the peninsula as acknowledged by the website of the spanish ministry of environment. 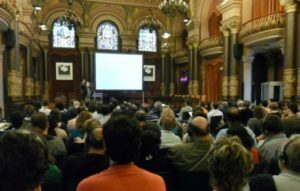 The city of San Sebastian welcomed the Zero Waste guests with an open conference in the City Hall which was filled to the brim to listen to Professor Paul Connett during almost 3 hours. One full day was devoted to lectures, debates and workshops in which it was discussed how to implement zero waste policies, how to evaluate them and how to bring people together to build a world without waste. In this occasion there were presentations from the Italian, Catalan and Basque zero waste networks but many new groups expressed interest to start building zero waste networks in their home countries. 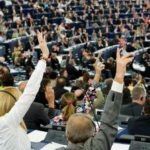 The Zero Waste Europe network committed to continue rallying municipalities around the Zero Waste goal, to promote certification of Zero Waste companies in Europe and to motivate the youth to join the movement to free their future from waste.